SuperMemo is based on the insight that there is an ideal moment to practice what you've learned. Reviewing too frequently is inefficient. Review too late and you will have forgotten the material and have to relearn it. The right time to practice is just at the moment you're about to forget. Unfortunately, this moment is different for every person and each bit of information. Imagine a pile of thousands of flash cards with Bible memory verses. Somewhere in this pile are the ones you should be reviewing right now. Which are they? Fortunately, human forgetting follows a pattern. We forget exponentially. A graph of our likelihood of remembering a Bible verse sweeps quickly downward over time and then levels off. This pattern has long been known to cognitive psychology, but it has been difficult to put to practical use. It is too complex for us to employ with our naked brains. SuperMemo is a program that keeps track of discrete bits of information you have learned and want to retain. For example, imagine you are memorizing Bible verses. Your chance of recalling a given verse declines over time according to a predictable pattern. 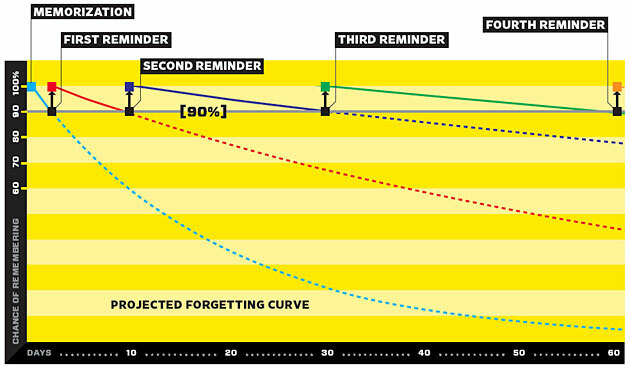 The SuperMemo algorithm tracks this forgetting curve and reminds you to rehearse your knowledge when your chance of recalling it has dropped to, say, 90 percent. When you first learn a new Bible verse, your chance of recalling it will drop quickly. But after SuperMemo reminds you of the verse, the rate of forgetting levels out. The algorithm tracks this new decline and waits longer to quiz you the next time. As you use Memverse you will find that you are able to retain more memory verses because the software prompts you to review passages at the appropriate time. In other words, you spend less of your time reviewing verses you already know, and more of your time on the memory verses that you don't know well. You will find that you are able to memorize more of the Bible in less time. Many users spend 10-15 minutes three or four times per week and are able to retain hundreds of memory verses. Many have even memorized over a thousand verses!